Is poaching MLAs from its rivals the only way the BJP can prove its majority? May 16 was a tense day in Bengaluru. After the Karnataka assembly elections threw up a fractured verdict the day before, there was no clarity about who would form the next government. With 104 seats, the BJP emerged as the single largest party. But, the Congress was uncharacteristically quick to act, extending “unconditional support” to arch rival Janata Dal (Secular), to stop the BJP. Yet, by around 9:30pm, the BJP confirmed that Governor Vajubhai Vala invited its legislative party leader B.S. Yeddyurappa to take oath as chief minister. The swearing in was fixed for 9am the next morning. The governor also gave him ample time—15 days—to prove his majority. The BJP criticised the Congress-JD(S) coalition, calling it a subversion of the people’s mandate and a sabotage of democracy. The Congress and the JD(S) reacted strongly to the move. They called the governor’s decision arbitrary and unconstitutional, and approached the Supreme Court to challenge the invitation to Yeddyurappa, in the middle of the night itself. At the time of going to press, a three-judge bench of the Supreme Court was hearing the petition. On May 15, as the results started trickling in, the scene was completely different. The BJP was surging ahead, and there were celebrations all across the state by party workers. But, when the final results came, the BJP fell short of majority by eight seats (see graphics). Sensing a chance, the Congress, which came second with 78 seats, reached out quickly to the JD(S), which had 37 seats, and also had the support of the sole BSP MLA. Congress leaders Ghulam Nabi Azad and Ashok Gehlot, who were camping in Bengaluru, approached JD(S) patriarch H.D. 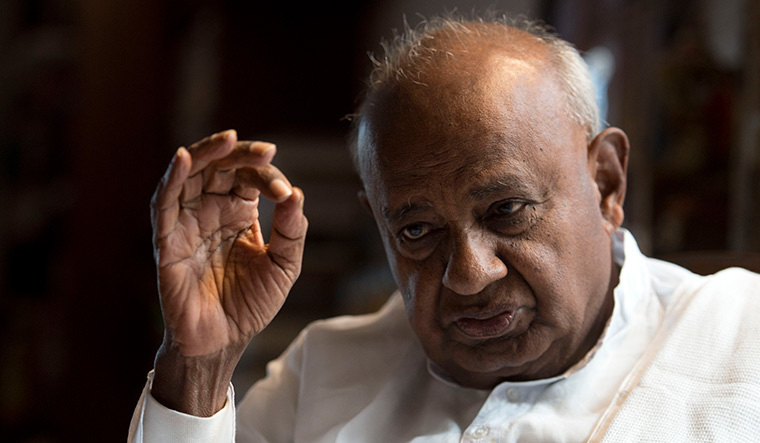 Deve Gowda to cement the alliance and offered the chief minister’s post to his son H.D. Kumaraswamy. The JD(S), which had a bitter rivalry with the Congress, surprised all by quickly endorsing the offer. 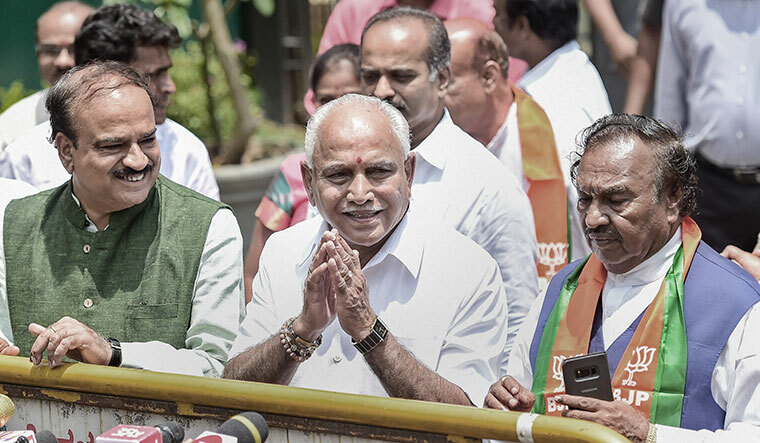 On May 16, both the BJP and the Congress-JD(S) coalition approached the governor, staking claim to form the next government. A BJP delegation led by Yeddyurappa and Union Minister Ananth Kumar was the first to meet the governor. Soon, a Congress-JD(S) delegation, comprising Kumaraswamy, and Congress leaders Ghulam Nabi Azad, Mallikarjun Kharge, Siddaramaiah, G. Parameshwara and D.K. Shivakumar met the governor and submitted the Congress’s letter of support for the JD(S). The Congress, however, seemed to have an inkling of the things to come. Even before the governor announced his decision, Congress spokesperson Randeep Singh Surjewala said the BJP’s claim to form the government on the basis of being the “single largest party” was against recent precedents. Last year, in Goa, the BJP with 13 seats was given the first chance to form the government, although the Congress was the single largest party with 17 seats in the 40-member assembly. Similarly, in Manipur, the BJP, which had 21 seats, formed the government, despite the Congress being the single largest party with 28 seats in the 60-member house. The situation was not different in Meghalaya, where the BJP with two seats formed a coalition government, while the Congress, even with 21 seats, had to sit in the opposition in the 60-member assembly. With both camps staking claim to form the government, citing precedents and legal judgements, Vala, a former RSS man, who is very close to Prime Minister Narendra Modi, had to flip through the pages of the Constitution and consult experts, including former attorney generals Soli Sorabjee and Mukul Rohatgi, to reach a decision. The BJP, meanwhile, criticised the Congress-JD(S) coalition, calling it a subversion of the people’s mandate and a sabotage of democracy. It said the two parties came together only to keep the BJP out. “The parties seem to have forgotten that the mandate was a complete rejection of the Congress’s and Siddaramaiah’s performance and policies,” said P. Muralidhar Rao, national general secretary of the BJP. The BJP said the Karnataka verdict was strongly in its favour. In his address to party workers on May 15, BJP president Amit Shah said Karnataka showed its unwavering trust in Modi’s “clean, transparent and pro-development governance”. “I thank the people for making the BJP the single largest party. The mandate clearly reflects that Karnataka has rejected the Congress’s corruption, dynasty politics and divisive casteism,” said Shah. “It is a vote for the BJP’s development agenda.” Modi made an emotional pitch to the workers, acknowledging their hard work as the reason for the Lotus blooming in Karnataka. Meanwhile, not all Congress and JD(S) leaders are comfortable with the new alliance. JD(S) MLAs from the Vokkaliga heartland fear that the alliance would hurt them as they had been opposing the Congress for a long time, especially in the Old Mysore region. Similarly, Congress MLAs from the Lingayat heartland are also worried. The Congress lost 14 seats in the Lingayat-dominated Mumbai-Karnataka region. Sitting Lingayat ministers Vinay Kulkarni, Sharan Prakash Patil and Basavaraj Rayareddy lost, making it clear that the Congress support for the Lingayat movement had backfired. The BJP, on the other hand, weathered the Lingayat storm with ease, keeping intact its hold on the community. The party bagged 30 of the 50 seats in the Mumbai-Karnataka region. The BJP’s performance was boosted by its star campaigner Modi. He travelled extensively, attending 21 rallies, covering 160 assembly seats. He held the brimming crowds captivated with his oration, seamlessly shifting between subjects as diverse as surgical strikes, the IT-City’s garbage woes, dying lakes, women’s safety and the agrarian crisis. He dished out new political narratives, adding a dash of history and invoking cultural icons and local heroes. His political rhetoric in chaste Hindi broke the language barrier as translators became jobless with cheering crowds wanting to listen to the prime minister uninterruptedly. 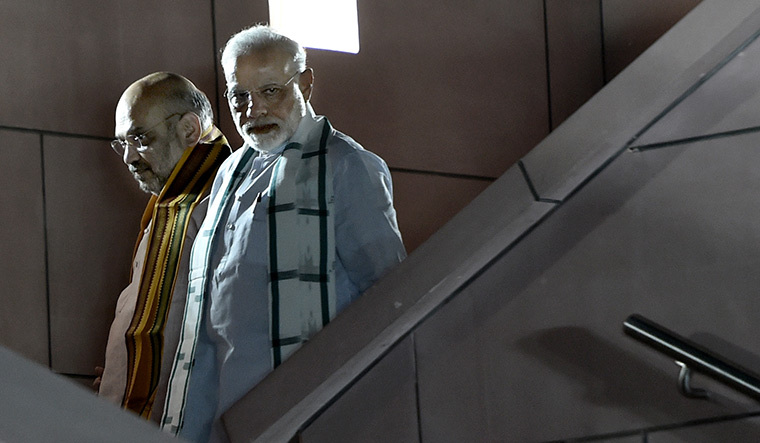 Modi had a team of locals to tutor him on region-specific issues and to fine tune his accent. His impressive oration in Kannada drew huge applause, just like his invocation of local icons. 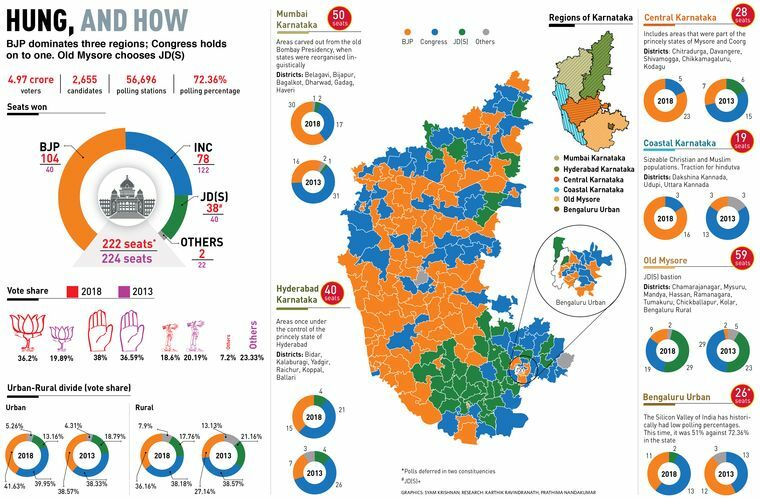 With Lingayat strongman Yeddyurappa on his side, Modi reclaimed the BJP’s traditional bastions—coastal Karnataka, central and Mumbai-Karnataka—and breached the Congress strongholds in Hyderabad-Karnataka with the help of leaders like Ballari MP and Valmiki leader B. Sriramulu, consolidating a winning vote-base of Lingayats, dalits and scheduled tribes. BJP president Amit Shah also played a key role in the party’s impressive performance. He rented a bungalow in Bengaluru, and crisscrossed the state relentlessly, working out new caste coalitions, especially with smaller, but neglected communities. His strategists dissected communities, decoded political undercurrents, tapped dissent and predicted the mood of the voters at every stage, which helped the BJP devise micro-level strategies. The hindutva plank coupled with the development narrative helped the BJP in the coastal region. The assurances of resolving the Mahadayi river dispute proved to be a hit in north Karnataka, while the stitching together of the dalits and the scheduled tribes turned out to be the game changer in central and Hyderabad-Karnataka regions. The booth level intervention to assess the party’s support base, which also galvanised cadres and mobilised voters till the election day, paid rich dividends. While the Modi-Shah combine scripted the BJP’s impressive performance, the complete reliance on Siddaramaiah turned out to be a disaster for the Congress. As he rolled out his campaign in April, he had challenged Kumaraswamy, “Nimmappraane, CM aagalla (I swear on your father, you will never become the CM). Yet, a month later, he was forced to announce Kumaraswamy as the chief minister candidate of the Congress-JD(S) alliance. Siddaramaiah himself faced a crushing defeat in Chamundeshwari, after an unprecedented Vokkaliga mobilisation in favour of the JD(S). He won narrowly—by 1,696 votes—against Sriramulu in Badami. As insiders point out, it was Siddaramaiah’s vocal criticism of the Gowda family that cost the party dear in the Old Mysore region. The Congress won only 19 of 59 seats, ten fewer than the last elections. 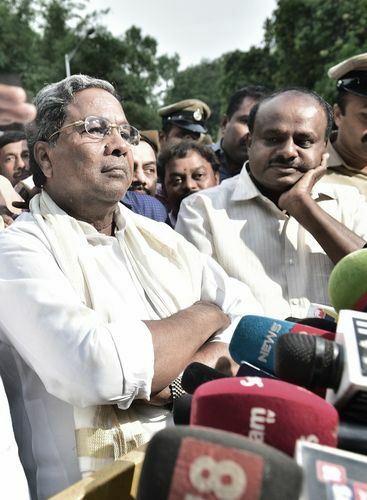 Sources close to Siddaramaiah said the debacle was the result of “internal sabotage”, aimed at engineering a hung verdict to deny the outgoing chief minister a second stint. The management of election funds, the absence of aggressive rallies by party leaders except Siddaramaiah and Congress president Rahul Gandhi, inadequate ground work and the failure to enthuse cadres all point to this, according to them. Siddaramaiah’s own follies, including giving up the Varuna constituency and moving to Chamundeshwari to help his son Yathindra’s electoral debut, and opting for a second seat (Badami) after sensing trouble in Mysuru, too, snowballed into a disaster. The setback has put a big question mark over the future of Siddaramaiah. For the Congress, however, the immediate concern is to keep its legislators together, even as the BJP steps up its campaign to prove its majority. Former deputy chief minister K.S. Eshwarappa of the BJP said a few Congress MLAs, who were earlier with the JD(S), did not want to go with Kumaraswamy. “They are in touch with us,” he said.